better way to enjoy the decorating process and time spent with your family, than with some delicious warm snickerdoodles right out of the oven?!?!....right?! Cream butter and sugars until light and fluffy. Add egg and vanilla, mix until smooth. In another bowl, add all dry ingredient. Whisk until combined. Pour dry ingredient into the wet ingredient. Mix until combined. Place cookie dough in refrigerator for 30-60 minutes. In a small bowl combined cinnamon and sugar...stir. Take a "walnut sized" piece of dough, roll it into a ball. Roll dough into cinnamon and sugar mixture. Place ball onto a lightly greased baking sheet. Press each ball down slightly so it resembles a cookie, more than a ball. Repeat until all cookies are made. Bake cookies at 300 degrees for 10-12 minutes. The cookies might seem undercooked, BUT they continue to firm up a bit after being removed from oven. 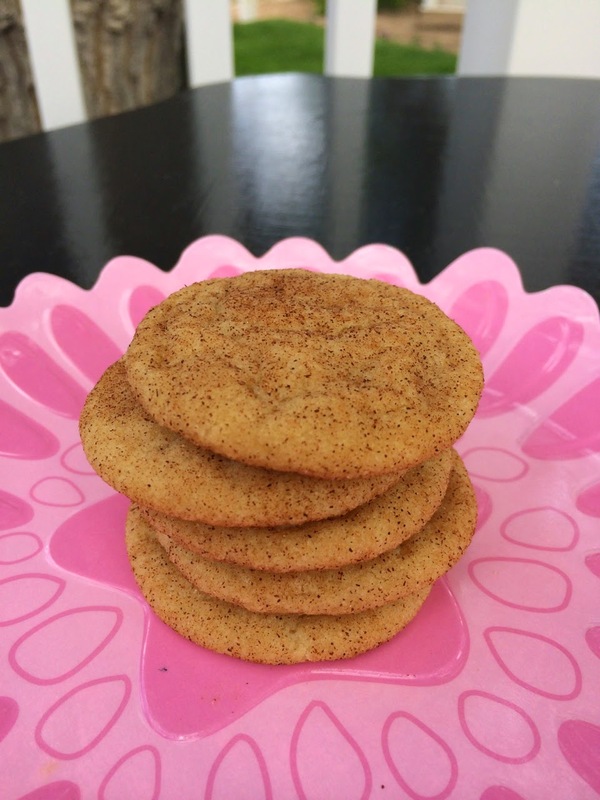 THESE snickerdoodles are soft, and chewy, and absolutely perfect!!! We here at BetterThanBurgers.net wants to wish each of you a very Happy Thanksgiving. We hope your day is full of delicious food, but most of all we hope you are surrounded by those you love. On this celebratory day we are truly grateful for each of you, our followers, and friends. Thanksgiving is TOMORROW!!! WOO HOO!! salad, because its all mixed up in a bowl and you eat it with a fork...therefore, it becomes a salad!! Add it to your holiday table tomorrow, you won't be disappointed! 1 package vanilla instant pudding (large box) DO NOT prepare, use it dry! Whip 1/2 cup milk and pudding together, until well combined. When pudding is mixed, fold in whipped topping. Chop apples into bite sized pieces (diced). Chop snicker bars into bite sized pieces. Add apples and snickers to pudding mixture. Stir until combined. Place salad in a "beautiful" serving bowl. Chill until ready to serve. Drizzle with caramel sauce RIGHT BEFORE serving. all kinds of scrumptious dishes and utilized the yummy fruit picked fresh from the trees. These Apple Pie Pancakes scream FALL. The delicious zest of cinnamon, and shreds of apple remind me of an apple muffin...and better yet, an apple pie! In a mixing bowl combine all dry ingredient. Stir with a whisk to combine. In a sseparatemixing bowl add all remaining ingredient. Stir wet ingredient until combined. Add in dry ingredient...a little at a time, stirring in between each addition. Heat griddle or frying pan. Spray with cooking spray. Scoop 1/2 c. batter and pour onto hot griddle. Let cook until bubbles form, flip and cook other side. Serve with butter and maple syrup. Top with a dollop of whipped topping. (I didn't have any....so I couldn't add the final touches!) EAT UP! "Jack Maximus Ady" aka "MAX"
He is an absolute doll and a bundle of JOY beyond words!! of us all! We are thrilled to pieces that he is here,..healthy, happy and STRONG!! REALLY???? YES....REALLY!!! THIS nacho dish will make EVERYONE smile! Slice apples into thin pieces, removing core. Arrange on plate. Drizzle with caramel topping. top with toffee bites and almonds. Serve immediately. an asian flare, but not too overpowering. These Baked Pork Chops are packed full of flavor and are moist and tender. Serve them with your favorite veggies and you have dinner! In a small bowl, combine all ingredient except pork chops. Stir until combined. Place pork chops in a zip lock bag. Pour marinade over pork chops in bag. Refrigerate for 30 minutes. Place pork chops in a 9x13 baking pan. Pour marinade from bag, over pork chops. Bake at 350 degrees for 45 minutes -1 hour, or until done. Serve with favorite side dish. make for the family, something that start their day of GREAT and that they will ask for again. which means EVERYONE will love it....my family did! Spray a small frying pan with cooking spray. Crack eggs in a dish, stir with a fork until blended well. Add salt and pepper (whatever amount you like). Pour eggs into HOT, greased pan. Cook until egg is almost cooked, flip and cook the other side. Top with cheese and bacon. Cover pan so the cheese will melt. Remove from pan. Set aside. Fry tortilla shell in a small amount of oil in the same pan. Cook until both sides are browned. Remove from pan. Top with eggs, diced tomatoes, avocados and whatever else you like. Breakfast is served. I saw this cool recipe on the internet and thought I would give it a try! when the family raves about their meals....this will get raves at your house too! Mix up your pancake batter according to instructions or recipe. Heat griddle or pan, spray with cooking spray. Pour desired amount of batter (I usually us 1/2 c. batter per pancake) onto hot griddle. Let pancake cook until bubbles form. Top with 1-2 slices of cooked bacon. Flip pancake and continue to cook. Continue until all pancakes are cooked. Serve with butter and maple syrup! Its the BEST!! Combine sugar, vanilla and butter. Stir until combined. add eggs, one at a time. Blend until all ingredient is mixed. Stir in cocoa and flour, mix just until combined. Spray waffle iron with cooking spray. Follow directions for your waffle iron as to how much batter to put in...(my waffle iron calls for 1/2 c. of batter). Let waffles cool slightly. Top with vanilla ice cream, caramel topping and sliced strawberries....OR you could used chocolate syrup if you desire. ENJOY!! I am thrilled to announce that after MANY years of waiting, Dayna, my partner in crime here at betterthanburgers.net, is expecting. We are ELATED to say the least!! We have watched this little peanut grow for 9 months and now HE is going to be here ANY DAY! !....I CAN'T WAIT!! I am going to take a "short" break from my recipe blogging to spend some much needed time with my family as we welcome this special little man into our lives. PLEASE don't forget about us and come back frequently to check out our recipes as well as pin them to your pinterest boards, share them on facebook and cook them up in your kitchens. DON'T forget that the holidays are just around the corner and there are some FABULOUS recipes on our blog to make your holiday meals absolutely AMAZING, and maybe even a little less stressful too! Enjoy browsing our blog....I'll be back soon!! so we eat it frequently at our house...I love the taste, the smell, the texture and all the delicious variations that can be created with this fabulous breakfast dish....THIS particular treat, is prepared the night before so you can just pop it in the oven in the morning. Its easy, its delicious and it makes you wish you would have made an extra pan for tomorrow's breakfast too.............! In a small saucepan melt butter, brown sugar, and corn syrup over medium heat until smooth, stir constantly so it won't stick. Pour mixture into a greased 9x13 inch baking pan. Spread until bottom of pan is covered. Place 6 slices of bread in a single layer to cover bottom of pan. Mix together eggs, cream, salt, vanilla and cinnamon. Pour 1/2 the mixture into pan, covering each bread slice. Place 6 MORE slices of bread into pan (if you are NOT using Texas Toast Bread...since its already thick...if your using this bread, pour ALL of the mixture over bread as you won't need to layer another piece of bread) over the top of other bread slices, pour remaining mixture over bread, making sure to cover each piece. Cover and refrigerate over night. Bake uncovered at 350 degrees for 25-30 minutes. Serve warm, topped with strawberry pie filling and whipped topping...its OH SOOOOOO GOOD!! Whenever I make a pot of steamed rice, I always seem to have tons leftover. For some odd reason I can't cook for just 3 people....WEIRD I know (I've been cooking for 8 for the last 30+ years). After throwing out rice, because I didn't really know what to do with it, I thought I would come up with some clever pilaf recipe of my own. It was a delightful change from the stand by "fried rice" that I usually throw together....and this Almond Rice Pilaf was a HUGE HIT, the family loved it!! Melt butter in a frying pan. Add slivered almonds to the melted butter and saute' until toasted and golden brown. Add rice, seasonings and 1c. of chicken broth. Cook on medium high for 5-7 minutes until liquid cooks off. Add remaining 1c. chicken broth and simmer for 5-7 minutes or until liquid cooked off. Serve with your favorite meat dish.